steppes (Harrison/ Heyd 2007, Heyd 2007, 2012, Jeunesse 2015, 2017). these innovations as arriving from the east with the Bell Beakers. extension of the Corded Ware and the Atlantic Ocean. What he is basically saying is that Corded Ware influenced the development of the Bell Beaker pottery, which would explain some of the earlier Iberian dates (collective graves). I marked up his map to show that R-M269 is missing from Western Europe during the Late Neolithic. 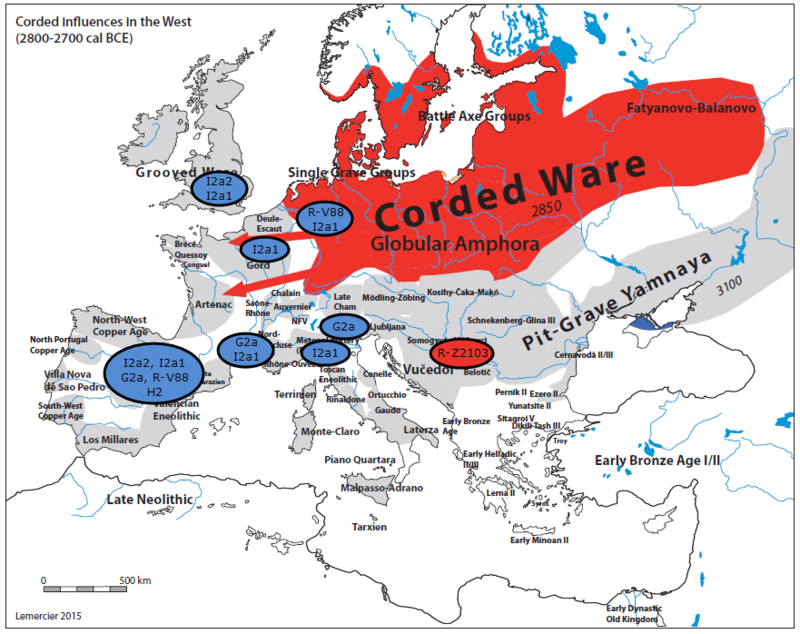 It is a damning visual for those that have continued to promote, after failing to show a Middle Neolithic presence of M269 in Western Europe, that M269 existed in Copper Age Iberia between 3000-2500 BC. Especially damning for the out-of-Iberia crowd is that the very culture that would need to be be pre-P312, that is, the Remedello Culture and the Treilles Culture of Mediterranean France, both belong to I2a1 and G2a. A soon-to be published paper on Switzerland will show the same pattern there as well. The more northern Paris Basin Dolmen of La Pierre Fritte is also I2a1 and dated to 2750-2725 BC. The most fitting backdrop music is certainly "Nowhere to Run, Nowhere to Hide" by Martha and the Vandellas! It is difficult to find the origin of Bell Beakers in one place (Fig. 6). Beaker only for Maritime vessels, or also apply it to the AOC beakers? equally early according to radiocarbon dating. practice as a drinking beaker. second time, but probably very fast. Another words, Maritime is not any earlier the All-Over-Corded beakers. Based on three radiocarbon dates, Lee (2012) states the following: "Kromsdorf dates firmly to the Late Neolithic (2,600–2,500 cal BC)." This is based on their dates of 2678–2547 cal BC, 2573–2511 cal BC and 2573–2511 cal BC. 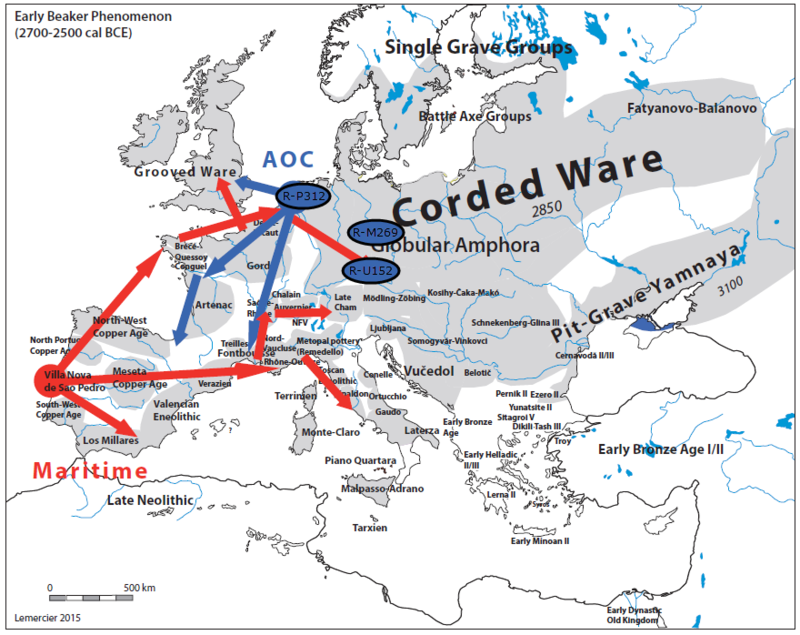 I think that Lemercier's Iberian Bell Beaker arrows are likely overdrawn in his next map, but for an area like France could certainly explain the early Alsacian woman with no-steppe ancestry. Last edited by R.Rocca; 01-06-2019 at 06:49 PM. I believe alan has been saying for years that he thinks early Iberian Maritime beakers were copies of Corded Ware beakers that Iberians acquired through trade at Grand Pressigny in France. We need the smoking gun that ties R1b-L51 to either Corded Ware or Yamnaya. My vote still goes to the Budzhak subcategory of Yamnaya. Last edited by rms2; 01-06-2019 at 07:18 PM. For the Mediterranean coast of France, Lemercier's article, "The Beaker Transition in Mediterranean France", which is Chapter 5 in the book, Background to Beakers, is a good one. The third phase, with the development of the Late Bell Beaker, is not comparable to the first model, but involves a new influx, now from the east with a new phase of hill top sites and the appearance of fortifications. By "first model", Lemercier explains that he means the model of exploration and exchange followed by settlement, which is like what happened in the region later with the coming of the Phocian Greeks. He points out that the first two BB periods along the Med coast of France, which he calls Campaniforme Ancien (Early Bell Beaker), and Campaniforme Récent (Middle Bell Beaker), were characterized by collective Neolithic tombs. Individual burials were rare. The only well-preserved individual burial from what Lemercier mistakenly believed was the Early Bell Beaker period is from Forcalquier-La Fare: an adult male on his left side in the typical Beaker pose, head to the north, with a beaker, a copper dagger, and a couple of other objects. Figure 11 includes some decent black-and-white photos of the burial site and skeleton. The interesting thing about that one is that the Bell Beaker man in it was included among the samples tested by Olalde et al. He had what looks to me like a substantial level of steppe dna. For that I am relying on Figure S2 of the Olalde et al Supplementary Info, which shows I2575 (the skeleton from La Fare) well to the left of the early Iberian BB individuals and solidly within the steppe dna range of most of the non-Iberian Bell Beaker people. Figure S2 does not give the percentage of steppe dna, however. So, even though Lemercier includes I2575 in his Campaniforme Ancien (Early Bell Beaker) period, we can see that he actually dates (via radiocarbon dating) to after 2500 BC (Lemercier's Campaniforme Tardif - Late Bell Beaker). Lemercier does admit, however, that the periodization of Bell Beaker sites and finds in Mediterranean France "is based on archaeological observations rather than on absolute dates, which are not abundant anyway" (page 121). Last edited by rms2; 01-06-2019 at 07:42 PM. I like this article: "Here are the pieces of the puzzle, here are some previous ideas on it, how can we make it all fit". That is how you approach this stuff. Like solving a puzzle. A soon-to be published paper on Switzerland will show the same pattern there as well. Source? As I think that in the Rhône region we'd find L51, so that's quite big. These show a ridiculous similarity (too big to be coincidental, they are way too similar) to the more numerous stelae on the Steppe, and some date to Late Neolithic-Early Chalcolithic period (i.e. too early to be ultimately derived from Yamnaya/Corded Ware). Last edited by Ethereal; 01-06-2019 at 10:53 PM. You might want to read Harrison and Heyd, The Transformation of Europe in the Third Millennium BC: the example of ‘Le Petit-Chasseur I + III’ (Sion, Valais, Switzerland). Then you might realize that there was a destruction horizon at Sion and nearby Aosta in Italy that dates to about 2425 BC, when all such stelae were thrown down and destroyed and reused in the construction of individualistic, single family burials rather than in collective, Neolithic burials. Within two generations, another significant change takes place at both sites. This is the destruction horizon around 2425 BC, at the end of the early Beaker period, when stelae on both sites were smashed and their fragments used as building material in new monuments (see Fig. 10). This marks a fundamental change in the prevailing ideology on each site. Such a change is clearly abrupt, violent and conducted quickly, so that every image was broken and thrown down. Not one remains intact at Sion, where the destruction was more complete than at Aosta. The distinctive accompanying material includes Bell Beakers that have links to the East Group. It signals an ideological switch in allegiance, transferred from the old Rhine-Rhône axis, to the new focus on the Danube. At Sion the destruction horizon is fixed firmly to the construction of the first megalithic cists, which are built on top of ‘couche 5C2’; at the same time the monument M VI is emptied, and the skulls and bones were removed and placed on its east side. The choice of the east side probably reflects the custom of burial in the Bell Beaker’s East Group where the heads always point to the rising sun in the east. The new monuments are built on the original site axis and generally respect its orientation. These cists, built with many stelae fragments, contain middle phase Bell Beaker material. Our interpretation of these events is that the cists represent burial places restricted to one family, and they mark the definitive change from collective burials in the Final Neolithic. We suggest that this destruction horizon is the intellectually transforming moment at both Sion and Aosta. The stable isotope studies describe how we can recognize individual immigrants coming to live at Sion from areas a long way to the east (Chiaradia et al. 2003). This moment is also reflected in the fundamental change of dental and cranial morphology of the Sion skeletons at the transition of the Final Neolithic to the Bell Beaker period (Desideri/Eades 2004), or, as we think, at the transition of the early to the middle Bell Beaker phase. This human mobility is convincing evidence that agrees with the distribution of artifact types, and the personal nature of the ornaments and weapons. In these burials we look upon the face of prehistoric Beaker migrants, who arrived as individuals, and not as a migratory population. It shows the importance of the individual person in promoting a cultural change. The conflict of ideas could therefore be seen as a doctrinal conflict within the Bell Beaker ideology. This fits the two distinct Beaker traditions that we identify, coming respectively from the southwest and the east. The Bell Beaker middle phase A2 is the climax of the development of the site. The cists reflect the new family based structures, that are dominant in the community and which follow the East Group customs (Heyd 2007). The only remains from Sion that yielded ancient dna test results for Olalde et al came from cist MXI, which was erected after the destruction of the stelae, using four slabs of broken stelae. Interestingly, the Yamnaya people did the same sort of thing with Lower Mikhailovka-Kemi Oba stelae, that is, they knocked them down and then reused them to construct their own burial chambers. Considerable evidence exists that they were employed in Later Eneolithic burials, especially in the construction of Yamnaya graves where they were used to cover the deceased. This was clearly not their original purpose since they were constructed to stand upright, and Dmitry Telegin suggests that they were originally manufactured by the Lower Mikhaylovka-Kemi Oba culture and later appropriated by Yamnaya tribes who reused them in their own burials. Last edited by rms2; 01-07-2019 at 12:05 AM. Also, as I am pretty ignorant about the finer details, was it not the case that the metallurgical elite were often buried individually? Last edited by Ethereal; 01-07-2019 at 12:44 AM. Well, because the prior occupants of Sion and Aosta buried their dead in collective Neolithic tombs and not in the sorts of single graves that everywhere accompanied the arrival of Kurgan Bell Beaker, steppe dna, and L51, especially P312. Besides I think you read what Harrison and Heyd said about the two different types of Bell Beaker, one from the southwest (i.e., Iberia) and the other from the East. The pre-destruction horizon occupants of Sion and Aosta belonged to the southwestern type. Olalde et al clearly showed that the southwestern type completely lacked both steppe dna and R1b-M269 of any kind. Except that the ancient dna supports the idea that Kurgan BB burials were largely single grave, Yamnaya-type burials, while early Iberian BB burials were collective, Neolithic types of burials that completely lacked R1b-M269 and steppe dna. Not sure why Besse left Britain and Ireland off her map, but it is what it is. Just out of curiosity, what is your y-dna haplogroup, if you know?